NAMM 2014: Building its reputation on imported Japanese models, Electra Guitars is an American brand that made a modest splash in the 1970s and early '80s, but had slipped out of active use until last year's relaunch. 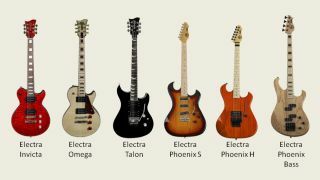 The all-new Invicta, Phoenix, and Talon Series will be available in February, and join the popular Omega and Omega Prime guitars introduced last year. The design aesthetics of the Electra Omega - belly cut and sculpted heel - are carried over to the body of the Invicta, which pays homage to a classic, original Electra design. The body is made from Swamp Ash topped with Quilt Maple and bound in multi-layer tortoise binding which gives it a unique look. The Invicta will also sport a 5-Way Rotary Pickup Selector. In concert with its 2 volume knobs it provides 7 pick-up combinations. It will initially be available in stunning Quilted Maple and Trans Ruby finishes at an estimated street price of $899. The Electra Talon´s aggressive double-cutaway design is a no-compromise metal machine. Available with either an all mahogany body or mahogany body with a quilt maple top, this is where style, design, substance and playability come together in one package. The Talon has a fast D Shape Neck, Real Ebony Fretboard, Real Mother of Pearl Talon Inlays and Floyd Rose Tremolo. The Talon will be available in a Gloss Black finish as well as Electra´s original Phantom Quilt. Street price is an estimated $899. The Phoenix S has an identical design as the H but utilizes three specially designed single coil pickups fed into a switching system that allows any and all combinations of the 3 pickups. Electra´s new Analog TBK allows players to mix in either the neck or bridge pickup without affecting the 5-way selection. Combined with MagnaFlux SC pick-ups, this will give players additional tones - neck+bridge, or all 3 pickups - with a 3 single-coil pickup config. The Phoenix S will be available in a Gloss Natural and Tri-Burst for an estimated street price of $599. Rounding out the Electra´s Phoenix line is the new Phoenix bass. It retains much of the forward thinking design ideas of the original bass while updating the design and electronics to meet the needs for the modern bass player. Moving the bass side horn out to the 12th fret and adding generous belly, forearm and treble side horn contours makes this bass comfortable to play while retaining its aggressive look. The Phoenix Bass is also Electra´s first collaboration with EMG and includes two specially designed EMG HZ-P pickups feeding a B/T circuit and 5-way rotary switch providing players a slew of varying tones. The Phoenix Bass will be available in a Swamp Ash body with Natural finish and Maple fretboard, as well as an Alder body with Gloss Black finish and Ebony fretboard. The Phoenix bass will start at an estimated $999.